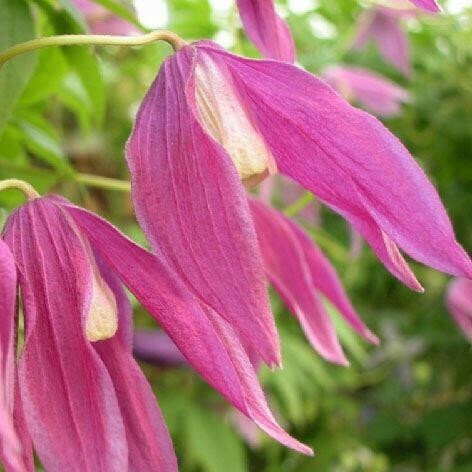 Clematis Columella has a vine-like growing habit and produces drooping, bell-shaped flowers that are deep purple or pink with faint white edging on the outside and a wonderful pale pink inside. The four or five petalled flowers are deliciously fragrant and will be even more so if planted in a sunny position. Flowering from around early April in to June Clematis columella prefers a moist, but well drained position. Why not try this lovely climber in your garden, it looks beautiful growing against trellis or fence. Strong plants supplied in approx 2-3 litre containers.